Mama’s Sunday apron, Sister’s first sundress, and the pièce de résistance—my red polka dot romper, were all to be found in the quilt Great Aunt Nell made. And find them I did. . .over and over and over! 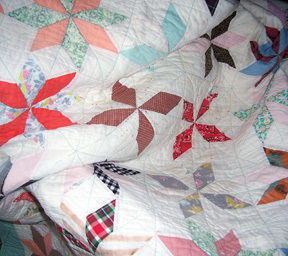 I’m not sure it wasn’t an early symptom of OCD, but oh how I loved to look for favorite fabrics as I lay under it and to see where they had been used (and how often) in the quilt. I recently got to celebrate Christmas early when I received a box full of Fat Eighth packs from Moda. What a treat to open it and look at all those beautiful bundles! But what do you do with Fat Eighths? One of the first things to come to mind was string piecing. I’d made a curvy table runner several months earlier and thought one of these gorgeous collections would be perfect for the pattern cover sample. 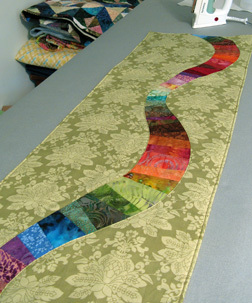 As I began playing with the idea—and trying to recall how I put together the original table runner!—I hit upon a way to achieve the look of string piecing with its variety of shapes, but without the need for a foundation (for stability) and without the kind of waste that usually accompanies it. So, I loaded up the car with sewing equipment and supplies and, of course, the box of Fat Eighths and drove to Texas to spend a week creating quilts with my mom. While my dad did some major pattern packaging, “Nana” and I made several quilt tops that will become quilts in the next few weeks. They will then be photographed for the covers of Seams & Dreams’ new patterns for Fall Quilt Market. 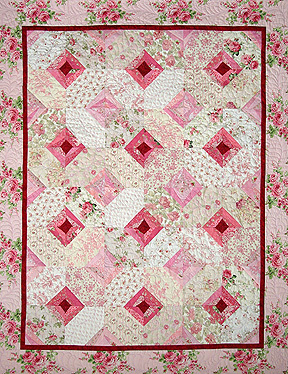 I’ve found in the past that a design that looks difficult can be a hard sell to quilting consumers, so it may be a challenge convincing them that this technique is EXTREMELY simple. A number of these patterns are in the works and will be designated with a “No Strings Attached” logo. I can’t wait to see if other quilters get as excited about this fun technique as I am! Previous Previous post: Lisa Bongean: Wool—You CAN Take It With You! 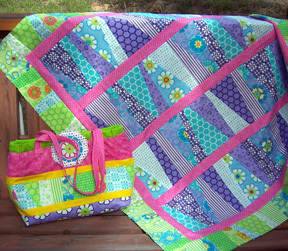 These quilts are absolutely beautiful. I’m excited to see what technique you’ve learned. The name is perfect. Those are some stunning quilts. 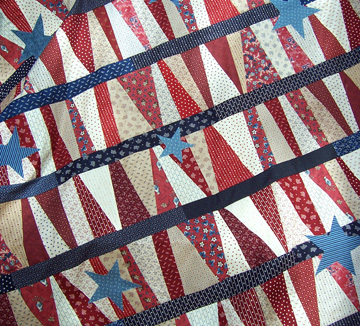 I don’t know why more people don’t use moda fabrics for their projects. The results are clearly fantastic! Thanks for sharing this with us.